0.37CT G-H Color, SI1 Clarity marquise cut diamond accompanied by 0.50CT TW of H Color, SI2 Clarity, round brilliant cut and baguette diamonds set in popular 14K gold. 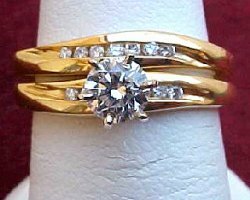 How Diamond Clarity is determined! 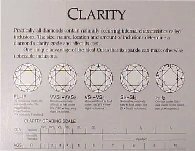 Diamond clarity is determined by an industry accepted grading-clarity scale standard established by both the Gemological Institute of America (G.I.A.) and the American Gemological Society (A.G.S.). 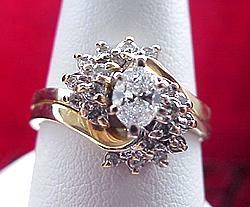 0.20CT round brilliant cut diamond with 0.15CT TW of round brilliant cut diamonds set in 14KW gold! 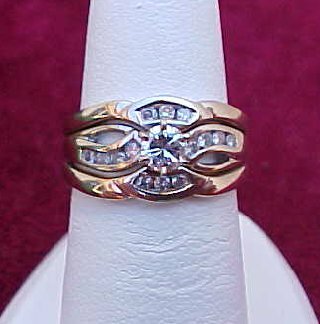 0.30CT round brilliant cut diamond of H Color, SI1 Clarity, engagement ring with 0.10CT baguette wedding band, both set in 14K gold! A very nice set! 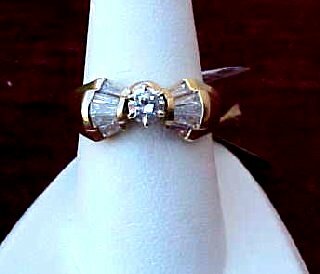 Here is a traditional diamond wedding set with a nice 0.33CT marquise cut diamond of G Color SI1 Clarity with 0.16CT TW melee diamonds of G Color, SI2 Clarity. 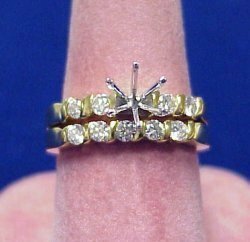 Check out this 0.12CT marquise cut diamond with 10 round brilliant cut diamonds set in our 14K gold mounting! 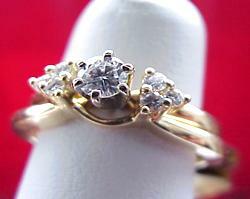 0.57CT TW round brilliant cut diamond wedding set of G Color, SI Clarity all set in 14K gold. 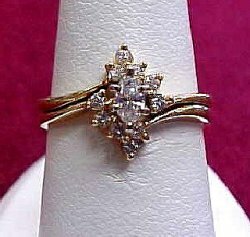 We have a great selection of Hearts and Arrows Ideal cut diamonds ready to be set in this beautiful piece. Check out this 0.32CT round brilliant cut diamond solitaire of I Color, VS2 Clarity...mounted in our 14K six-prong tiffany mounting! 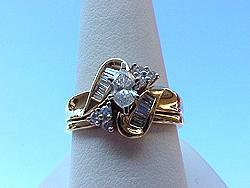 Check out the 14K gold wrap (priced separately at $380.00)! How Diamond Cut is determined! 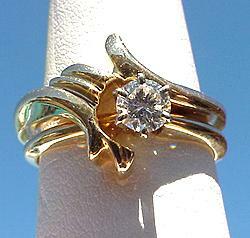 Diamond cuts can be rated three different ways: ideal cut, premium cut, and inferior cut. Ideal cut diamonds have been cut by a master cutter to exact mathematical proportions. Premium cut, while not as good as ideal, still achieves a harmonious balanced diamond. 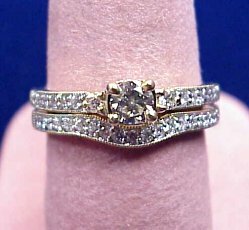 Inferior cut maximizes the weight of the diamond at the expense of fire and brilliance.